Absolutely stunning! 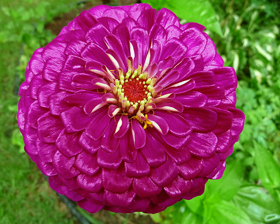 Huge flower heads with incredible color make this Zinnia Purple Queen an ideal cut flower. Blooms are a vibrant purple, about 10-15cm across, and magnificently full and uniform. This zinnia easily takes center stage where ever it is planted. Height 50-80cm. Sow zinnia seeds on the surface of a good, free draining, damp, seed compost. Then lightly cover, 3mm deep with vermiculite or compost. Place container in a propagator or seal inside a polythene bag at a temperature of 20-30C until germination which usually takes 7-14 days. Can also be sown direct into the soil after last frost.